The match attracted great interest – a lot of spectators crowded in front of the tables, and at some point the arbiters, at the request of Vladimir Kramnik, moved some of the most curious further away from the players. We were all of the opinion that the 2nd and 3rd rounds had been very tough for us. And there was a feeling that we’d managed to come through a difficult patch. It doesn’t mean that it’ll be plain sailing ahead. But today, strange as it sounds, the match was a lot easier than the previous two. 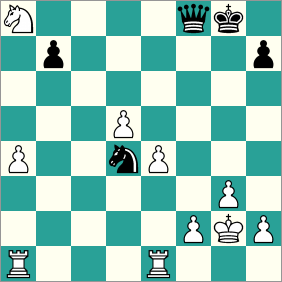 The position in the Kramnik – Nakamura game, of course, was hard to evaluate, but you never lost the sense that white should be better, that Volodya would win or draw. There were almost no worries about the outcome of the game. I think we’ve witnessed a great battle. I won’t try and judge how logical the outcome was. 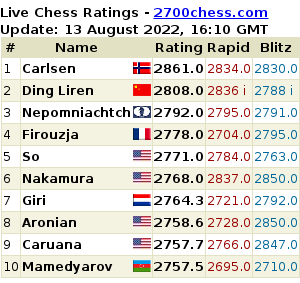 But Nakamura demonstrated phenomenal resourcefulness in solving the complex problems that Kramnik posed him. Your commentator didn’t find the time and/or desire to glance at what was happening in the other games today (and so I’ve no idea what’s going on there). If only it was always that way! The move 34…Nc2, of course, didn’t win. White could draw in various ways. The simplest is: 35. Nc7 Qb4 (and just try to find that!) 36. Reb1 Qxe4+ 37. Kg1 Nd4 (the exchange on a1 leads to a quiet game with chances for white) 38. Rxb7 Nf3+ 39. Kf1 and black has nothing better than perpetual check. We expected that Kamsky and Grischuk would play some very sharp Sicilian, but Gata played Nf3 and g3 – he decided to go for long-term play. Sasha managed to outplay him. At some point heavy manoeuvring began, and Sasha out-manoeuvred him. Gata got nervous and began to hit the clock – clearly there was time trouble, and he’d stopped liking the position. He moved and moved, but then he had nothing left to move with. There were a lot of pieces, but none to move with. I bumped into Gata coming out of the playing hall and he was unnaturally pale, with his head thrown back and his eyes half-closed. He was scrolling through the encounter in his head and trying to understand where he’d made the decisive mistake. You can lose in many ways, you can blunder, you can pick up the wrong piece in time trouble, but to lose LIKE THAT?! Losses like that leave a very painful imprint on a sportsman’s soul. But the idea’s simple: white in Karjakin’s hands is like a lightsabre in the hands of a Jedi Knight. Karjakin caught Yury Shulman out immediately in the opening and got an almost won position (it seems, out of his home analysis). I was put on board three specially, though I thought I could also have played on the last, with black. In that case Svidler would have played Onischuk with white. In general, Peter and I have a similar opening repertoire, so after it was decided that I was going to play he helped me with my preparation. For which I’m really grateful! The only worry was our fourth board. 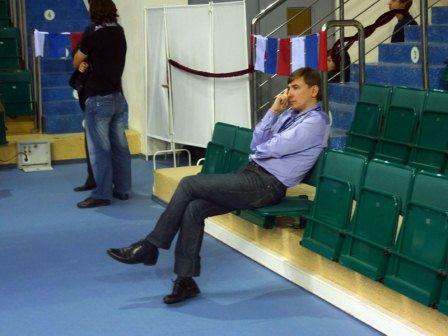 Voldoya Malakhov came up against a “novelty” that even the building’s cleaning lady knew about. But he just sat there, amazed… In the struggle that followed, however, Malakhov managed to establish counterplay with the help of an extremely tenacious defence, and it all ended up fine. While Malakhov really did get into a dangerous position, a pawn down. But generally he holds such endgames very confidently, and we were hoping that he wouldn’t lose. You have to put in a lot of effort to beat him! Barsky quoted Sergey Rublevsky as saying “the gas attack’s starting again”, in reference to the Chinese chess players apparently having smeared themselves with “fragrant (to put it mildly)” ointments. Other photographs include the arrival of the “2 Ks”, with Kasparov signing autographs, and a contestant praying during the round. It’s a pity. After all it’s nothing terrible. It’s much worse. It’s funny. I think they should have stopped at the number 3. Everyone would still have accepted that. But 5 – it’s clearly too much. He also “pops the question” (sort of!) to Veselin Topalov, who shows off his wedding ring and confirms that he’s just got married. Running through the report is the theme of the weather having taken a turn for the worse. 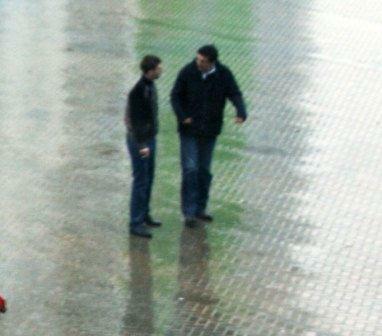 Can you identify these suspicious figures Vasiliev spotted in the Khanty-Mansiysk rain? You really put a lot of effort into these translations. The gentle editorial touch makes for a better read and understanding. As always, fantastic service mishanp! You’ve made it to an icon on my favorite bar! 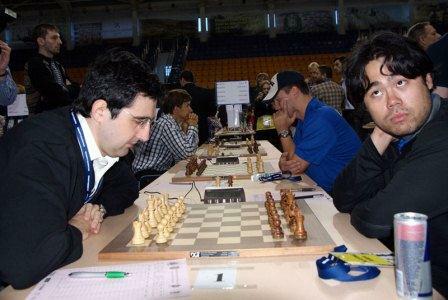 The figure on the right in the “mysterious” pic is Kramnik; not certain who the other person is. A wild guess: the other guy looks like Alekseev. Thank you once again for the translations. They are interesting, enjoyable, informative and much appreciated. 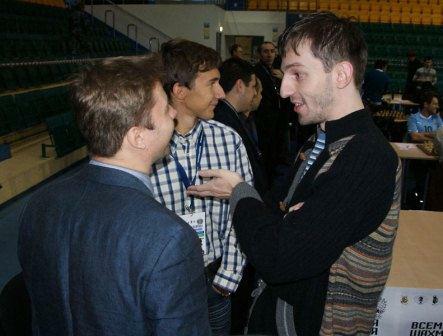 About the photo: it is Kramnik explaining to Grishuck how difficult is not to draw playing against Leko.